December 2018 brought more than the usual amount of Christmas cheer to the young people of North Hackney, thanks to a surprise visit from four of Arsenal FC’s first team squad. The players arrived to try out a new 3G pitch construction funded by The Arsenal Foundation and designed and installed by ETC Sports Surfaces. 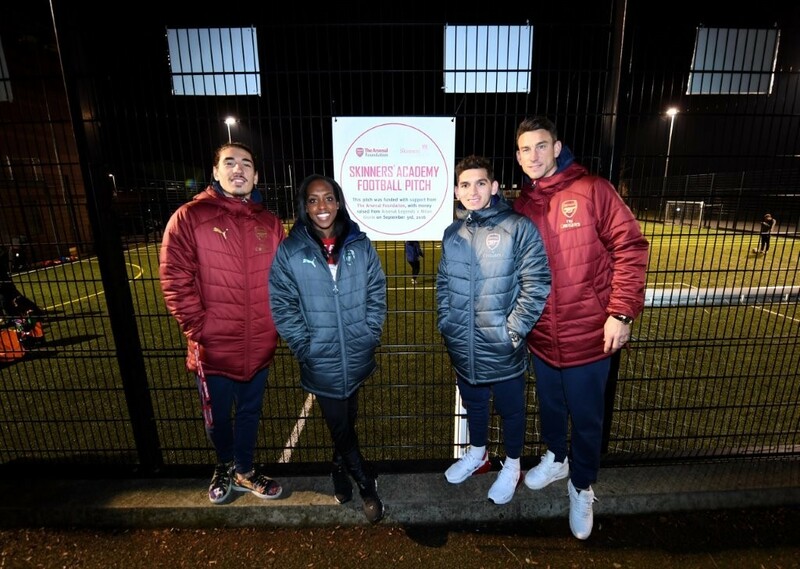 The visit – part of the Foundation’s “Arsenal Giving Together” initiative – saw the Gunners’ right back, Hector Bellerin, enjoying a kickabout with youngsters on the 3G pitch, whilst Arsenal Women forward, Danielle Carter, mingled with the crowds. Meanwhile, centre back Laurent Koscielny (who made his first appearance of the season just 24 hours earlier) and midfielder Lucas Torreira delighted young fans further by handing out Christmas presents during a meet and greet. 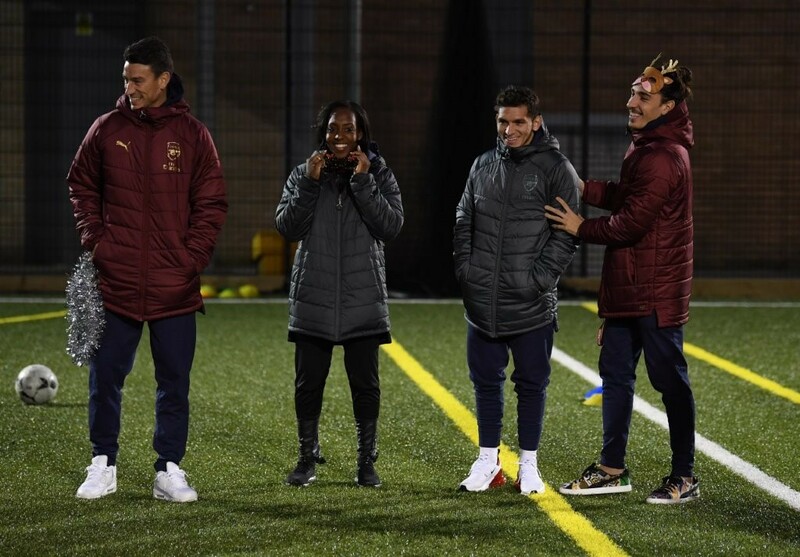 The players excitedly tweeted photos of their visit to the new all weather pitch – an event that they clearly enjoyed as much as the Academy’s students. Bellerin took to Twitter to highlight the importance of providing a safe space for the youngsters to be themselves, with his followers proclaiming the visit to be “awesome” and a testament to his status as a “role model for so many young children”. Skinners’ Academy’s students also responded to Bellerin’s tweet to confirm that everyone at the Academy is “buzzing about football” thanks to the Premier League team’s involvement. Driven by an ethos to “be the best you can”, Skinner’s Academy is inspired by Olympic and Paralympic values and strives to ensure that the school contributes to London 2012’s legacy. Girls and boys aged between 11 and 19 receive a world-class education in state-of-the-art facilities, which have been further improved by the installation of the new Conqueror 60 MF pitch, manufactured by Playrite and installed by ETC Sports Surfaces. This market-leading pitch features a tufted fine fibrillated 3G pitch construction, underlaid with sand and rubber infill. 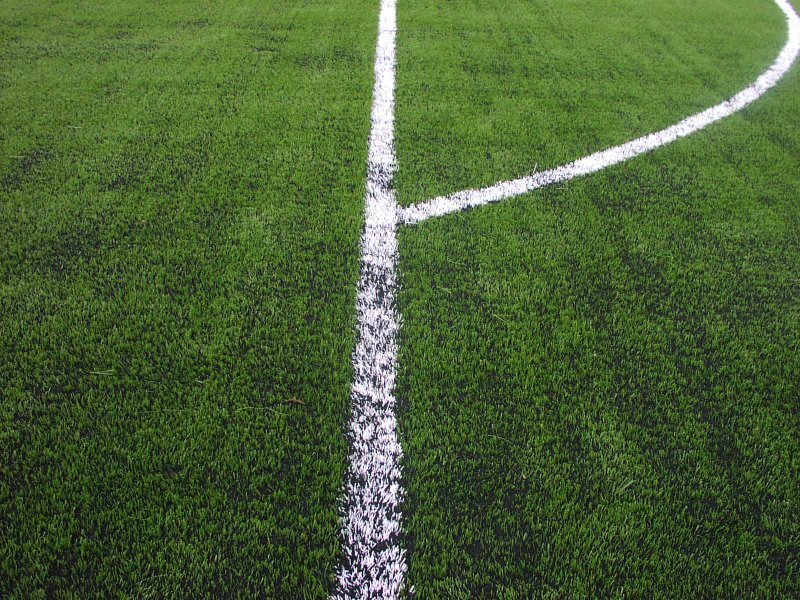 The pitch is designed to offer excellent shock and slide performance, stud and weather resistance and cost-effective sports surface maintenance. The result is a modern, safe and high performing 3G pitch that sits beautifully within Skinner’s Academy’s 21st century facilities and guarantees safe, all-weather play. 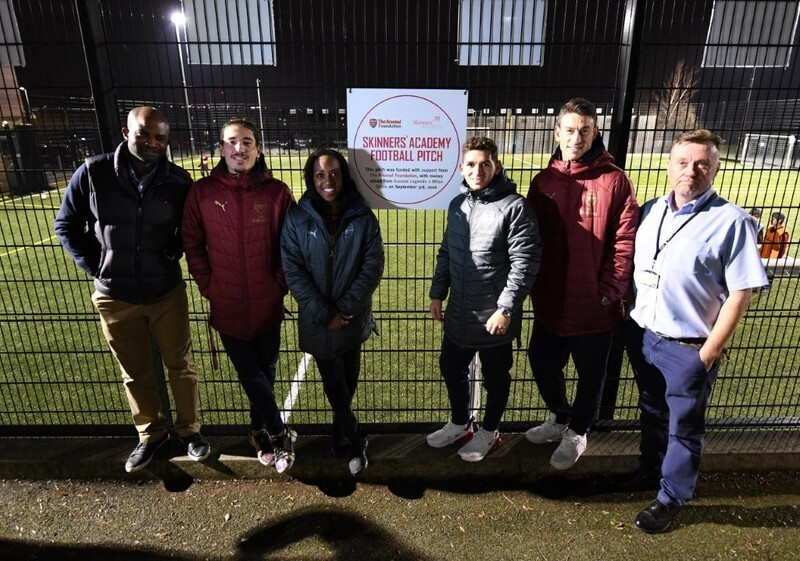 The Arsenal Foundation’s contribution towards this football pitch construction is part of Skinners’ Academy’s ongoing relationship with Arsenal FC in the community. Recent years have also seen Academy students receiving an Education Innovation Award in front of a 60,000-strong crowd at Emirates stadium, as well as Arsenal participating in a Careers and Education Awareness Fair for year 10-12 students. In conjunction with The Arsenal Foundation’s hugely generous £50,000 donation towards the new 3G pitch cost, this is a community relationship that’s making a real impact on future generations. The team at ETC Sports Surfaces is always delighted to be involved in projects that encourage a love of sports amongst young people. 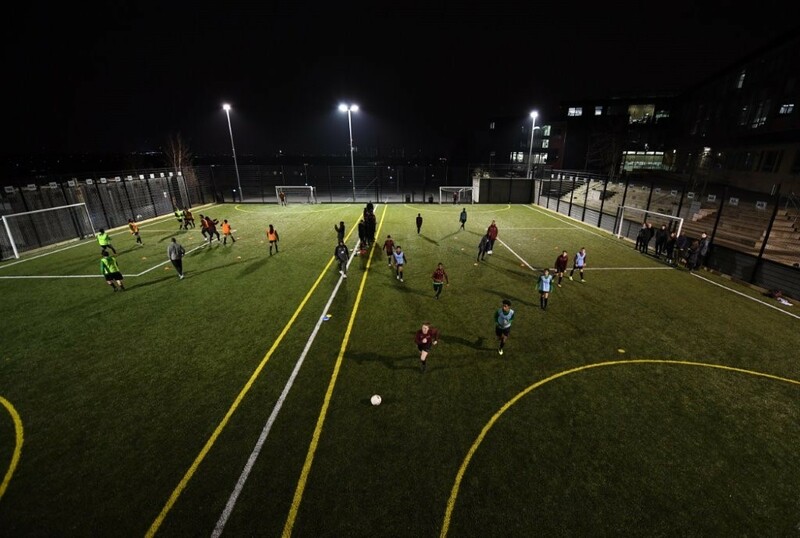 So, when Skinners’ Academy selected us to install their 3G pitch, we naturally went all out to deliver the project within the specified timing and budgetary parameters. Practical completion was delivered within just six weeks, allowing for the heaviest works to be carried out whilst students were off-site for the summer holidays and ensuring that they could enjoy the facility on their return in September 2018. The football pitch construction was finished with goals and a pitch divider system made by MH Goals, accommodating both 7-a-side and 5-a-side football to maximise the use of space. We’re thrilled to see Hackney’s young people benefitting from The Arsenal Foundation’s generosity and enjoying the sporting opportunities that their new 3G pitch construction offers. We wish everyone at the Academy years of enjoyment from their new football pitch, now and long into the future! 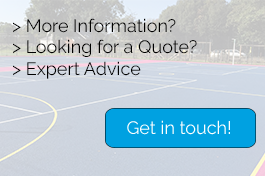 Are you considering a 3G football pitch construction for your facility? 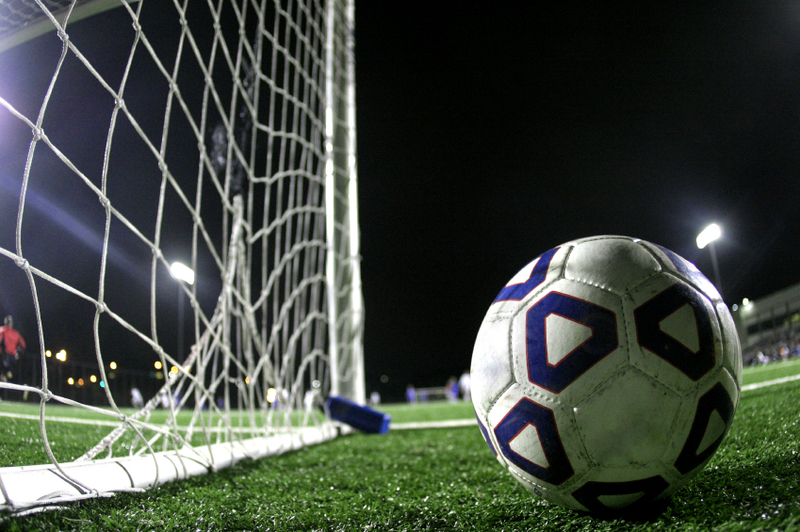 Find out about the benefits of 3G pitches. Understand what’s involved in planning your football pitch maintenance. Explore our range of sports fencing and sports floodlights. For a free, no obligation site survey, or simply some general advice, contact us and our fully qualified people will be happy to help.